Using RSS feeds, you can connect your brand’s YouTube channel to Edgar, add a feed of your favorite Pinterest board, load your brand’s blog posts and more. If your business has a blog, just enter your blog's URL on Edgar's Import page. Edgar will check it for an RSS feed and add it. Most RSS feeds are set to host 10-20 posts by default. Want to import more posts from your blog? If you're on WordPress, you can. Find out how: Feeds FAQs. If your site doesn't have an RSS feed, contact your web developer or check out the help center for your blogging platform to find out more about RSS. You can connect any YouTube channel by copying and pasting the channel url into 'Connect RSS Feed' box on the Import page. YouTube will give Edgar links for the 15 most recently uploaded videos from the channel. Any time there is a new video added, Edgar will add that video's link when he performs his daily import. To import links to pins from Pinterest, find your User RSS feed by entering your Pinterest URL and adding /feed.rss to the end of the URL. You can find the RSS feed address for a Vimeo channel's uploads, likes, or collections in the bottom right hand of those pages. Or, use the example URLs below and replace the [USERNAME] or [COLLECTIONID] with those from your Vimeo channel. Many popular news websites include a table of contents of RSS feed addresses for each of their news categories. Links to BBC RSS feeds are located here: BBC News Feeds. When adding an RSS feed, you can choose for the feed to go to the Pending Content Queue or Direct to your library. Choosing Direct to your library means the content imported from this feed will be sent to the Library and be available for publishing immediately, according to your schedule. Choosing Pending Content Queue means Edgar will hold this content for you until you approve, reject, or edit it. We recommend this option to give you a chance to edit posts to add comments, variations, or media before publishing. 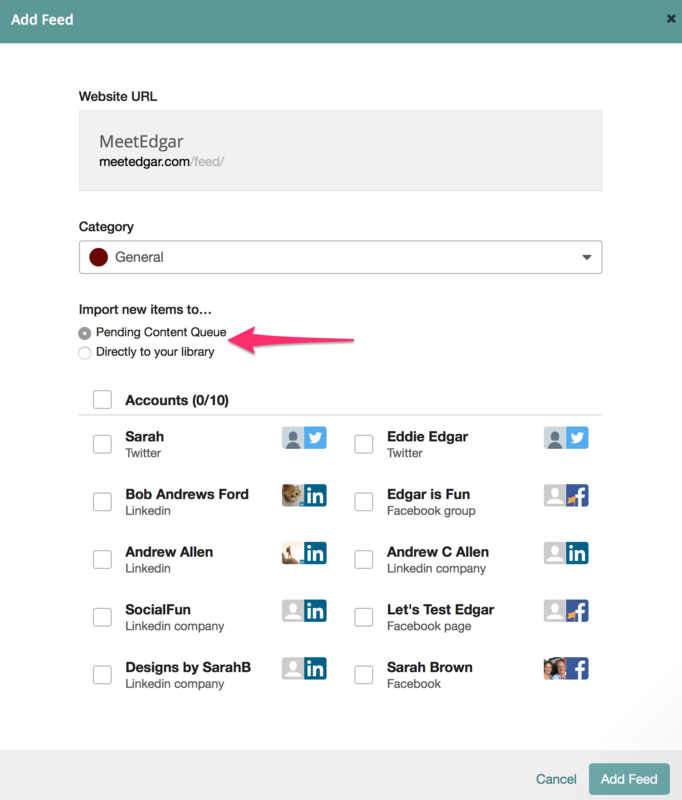 Edgar gives you the option to send your RSS content to your Pending Content Queue. This means you have a chance to approve, reject, or edit the posts before they're published. We recommend you edit posts before they're published to add your own comments, additional variations, or even uploaded images or video. Creating unique, personalized content from links imported from RSS is a great way to build a robust library. Need more Edgar strategy? Just reach out to the customer experience team by clicking on the speech bubble at the bottom right of the page!